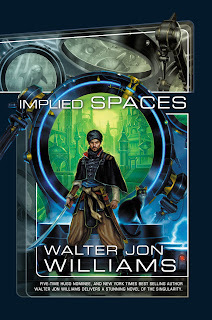 Walter Jon Williams let me have this jpeg of the cover of his new book, Implied Spaces . This book takes place post-singularity in a world where the humans are immortal, rebootable, and back-upable. Their existence is carefully monitored and controlled by six great supercomputers, and then what happens? Yeah, you guessed it. A supercomputer goes rogue. The concept of an "implied space" is a space that must exist given what you know of the surrounding structure. This book is about more than just implied "spaces" though. The implications of this world are far more sweeping than that. And it is this concept that drives the main plot in a direction that I'm guessing few will anticipate. This is merely the latest in Walter's long and distinguished career. I had meant to do a post that covered more of it today, but time is short. I shall do it Monday.